Recent research report on significant decline in insect populations. In Germany a 75 percent decline in total flying insect mass has been observed over a duration of 27 years in natural reserves (Hallmann, 2017). 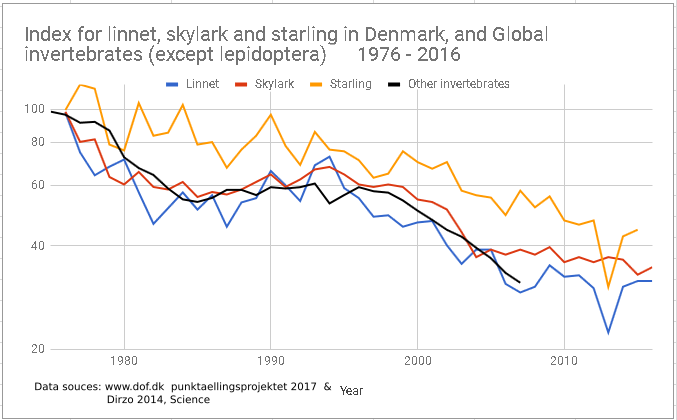 Another study reports on a 45 percent decline in invertebrate populations over the past 40 years based on global monitoring data (Dirzo, 2014), see figure below. I think this is disturbing news. A future scenario where major insect populations have collapsed and insects are largely abundant looks quite realistic with the current decline rates. This would be just sad in every aspect. Insects are fundamental drivers of ecosystems, food chains, biological processes and biodiversity. It is hard to imaging how such decline is going to affect the biosphere and natural world. At a distance, I guess, most could still look quite normal, since many plants could still be growing well, but below this superficial beauty, one would find a very limited and monotone ecosystem, without complexity, substance, nerve or bite. Wild nature could become like over-maintained city parks; tamed and boring, only filled with predictable sounds or eerie silence. 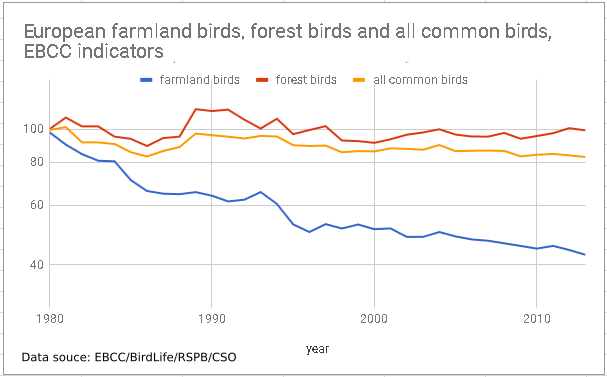 At a European scale, the trends for common farmland birds and common forest birds (EBCC ) also show a clear decline for the farmland birds, while forest birds are on a stable level. 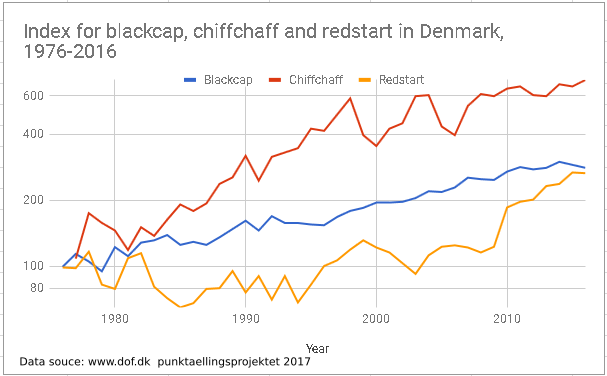 Many birds are declining, but there are also examples of bird species which are radically increasing in Denmark, including the insect feeding (and beautifully singing) blackcap, chiffchaff and redstart . So, in the present picture it looks like the main problem regards the farmland. Here the decline of insects and birds seems to be going hand in hand. For forest and other habitats, there is less of a clear overall trend, but still a lot of change with species increasing and declining. In my view, I strongly suspect certain modern pesticides to be getting a bit too effective and even accumulating and spreading far outside the area where sprayed, causing mass dead of insects in much larger areas and on a much larger scale than intended. At the same time, more and more land is included for intensive agriculture and urbanization, globally. Carry out more systematic monitoring of insects, to be able to understand and address the problem optimally, and to cover up for current lack of systematic long term observations. Use highly biodegradable pesticides and identify and ban certain pesticides which are particular problematic to insect populations. Apply pesticides more effectively and in smaller precise amounts, e.g. by use of precision agriculture. Stress the importance of having areas (of significant sizes) of wild and untouched nature. But, despite many good intentions and efforts, easiest solution in many cases will still just be to use some cheap pesticide. So I am actually not too optimistic for the future. It will likely only go in one direction. This is definitely a complex topic which I am going to follow closely in the future. All graph data have been extracted and digitized using the http://www.graphreader.com online tool.